There are two things to remember about tile cutting. First, a tile saw can only be as good as the blade attached to it. Second, there’s no such thing as the best all-around tile blade. There is instead the right blade for the right material. Simply put, the blade you buy must bring out the best in your tile saw and have the required specs to work effectively on the tile material that you intend to cut. 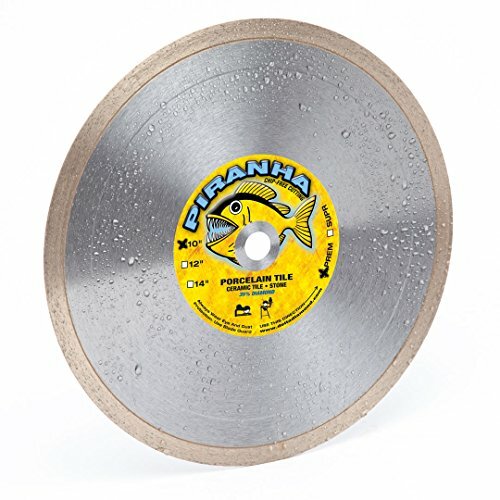 So how do you choose the best tile saw blade for your project? What combination of specs and features will be most advantageous to you? Of course, you can always refer to your local tool supplier, but it won’t hurt to know some basic facts about diamond blades. Arbor hole – this is the hole at the center of a saw blade which must match the size of the saw’s arbor or shaft. The usual diameter is 5/8”, though other sizes are available. Core – this is the inner section of the blade and is made of heat-treated steel. It is designed to support the diamond edge affixed to it and handle both centrifugal force and heat. Blade cores are tensioned to reduce vibrations and distortions. Rim or edge – this is the bearing segment of the blade which grinds or cuts the tile. This segment is made of synthetic diamond particles fused to metal powders, such as copper, iron, nickel, and tungsten. 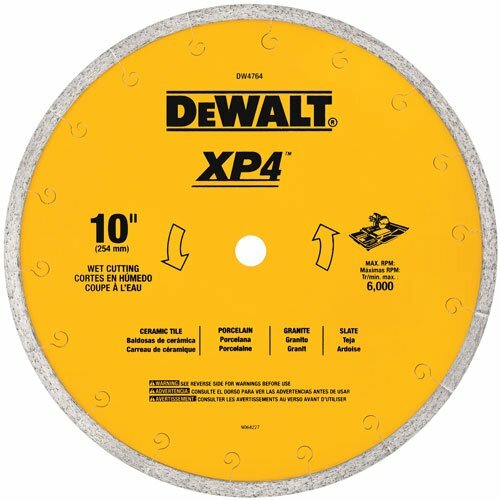 The diamond particles vary in size and concentration and will determine how a tile saw blade performs. The metal bond is responsible for holding the diamonds in place. 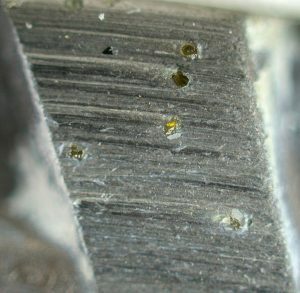 It’s time to replace the blade when this diamond-and-metal segment completely wears off and the steel core starts to show through. When shopping for a quality tile saw blade, always keep in mind the variations in the blade’s properties, the diamond segment, and the material you’re cutting. Blade diameter is the size of the disc-shaped diamond blade, measured in either inches or millimeters. The diameter of tile saw blades typically run from 4 to 12. An 8-inch blade, for example, can cut up to a depth of 2 inches. In comparison, a 10-inch diamond can cut up to 2.5 inches. Blades are designed to operate at a specific speed range. For optimum performance and safety, look for a blade with a maximum rpm that matches your saw’s speed. 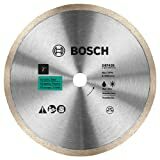 In general, larger saw blades have lower allowable speeds than smaller blades. The optimal range is 4500-7500 rpm for 8-inch blades and 3600-6000 rpm for 10-inch ones. At any rate, always refer to the manufacturer’s specified rpm. Bond hardness refers to the level of rigidity—soft, medium, or hard—of the bonding matrix which keeps the diamond particles in place. Descriptions of diamond blades don’t always include their bond hardness, but whenever they are, the guide below applies. Diamond grit or mesh size refers to the diamond crystal’s grit size. Blades for tile-cutting purposes have mesh sizes between 80 and 220, which are designed for cutting materials ranging from brittle to hard. A low mesh size number corresponds to a coarse grit, while a high mesh number indicates fine grit. Choose a high number if you want a fine and chip-free finish. The higher the mesh number, the finer the diamond particles will be and the slower the blade’s cutting speed will be. A lower mesh number means larger diamond particles resulting in a coarser finish and faster tile cutting speed. The diamond concentration is the proportion or percentage of diamond particles in the mixture that makes up the blade’s cutting edge. An effective concentration ranges from 25%-75%. If it’s too high, diamond particles may detach from the matrix. Too low, and it may reduce the blade’s cutting power. The cutting segment’s width or thickness affects your tile saw’s cutting speed. A thin blade helps to reduce heat buildup and chipping of the material. Don’t let the cutting segment’s height mislead you into thinking that a taller height means longer blade life. When considering a blade’s performance, segment height is not as crucial as bond hardness, diamond size and concentration, and suitability for the material being cut. It will only matter if you’re comparing between two blades that are equal in almost all important aspects except segment height. In such a case, the blade with the higher segment will have a longer life. The 6-1008BW is one of four diamond products under QEP’s Black Widow series. It is a premium blade made for jobs that require quick and chip-free cutting performance. You can trust it to work flawlessly on impervious porcelain tiles or abrasive marble materials. 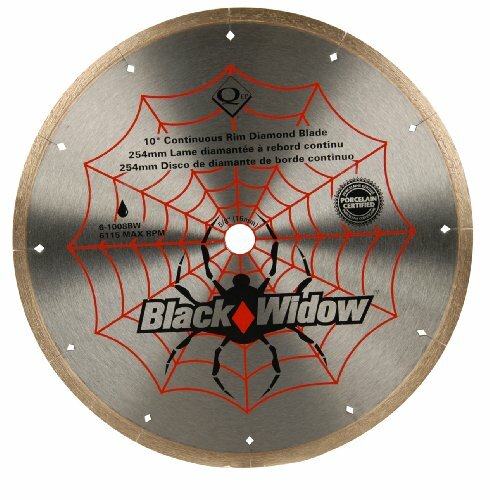 All Black Widow blades have laser-cut slits along the perimeter, which extend to the core as diamond-shaped cutouts. This feature reduces wobbling and heat buildup, which both affect a blade’s performance and longevity. 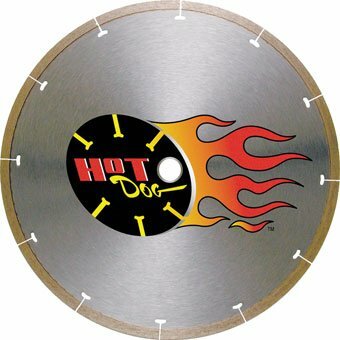 MK Diamond’s MK-225 Hotdog blade is one of the thinnest diamond blades available for dense tiles like porcelain and hard granite. This thinness makes it ideal for cutting vitreous tiles. Like the Black Widow blade by QEP, MK-225 has evenly distributed cooling slots around the fringe of its steel core. 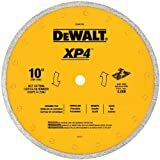 DeWalt is a household name supplier of power tools and accessories, and you can find some of the world’s best tile saw blades in its XP4 series. 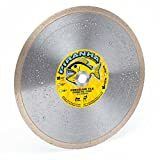 The diamond blade line boasts a cutting matrix that will reportedly last four times longer and cut 20% faster than the average tile saw blade. It doesn’t have the cooling cutouts of the Black Widow and MK-225 Hotdog blades, what it has instead are expansion cuts on the cutting edge to prevent overheating and warping. 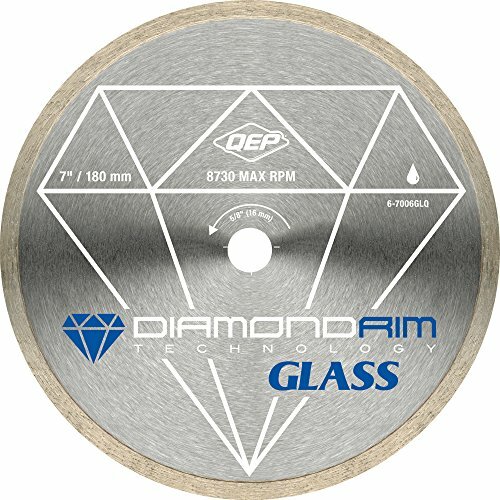 QEP’s glass series diamond blades are specially made for glass tiles but will also work for porcelain tiles. 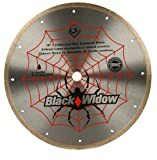 Unlike their high-speed Black Widow cousins, these blades are made for slow yet precise glass cutting. 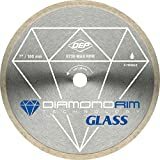 For your delicate glass backsplashes, we believe nothing will work better than this glass tile diamond blade. When using them, remember that they don’t cut as aggressively as other blades, so your pace will be slower than usual. Delta Diamond’s 10-inch Piranha tile blade is one of the few tile blades with a 10-mm high diamond segment. As mentioned in the guide, this alone should not be the basis for determining a blade’s longevity. We’d like to note the manufacturer’s transparency in disclosing Piranha’s diamond concentration (35%), which is something that cannot be said of other brands. This particular model is thicker than the ones we have previously mentioned, and it’s recommended for general tile cutting. Cost-effectiveness is an important factor when deciding on the right tile saw blade to buy. 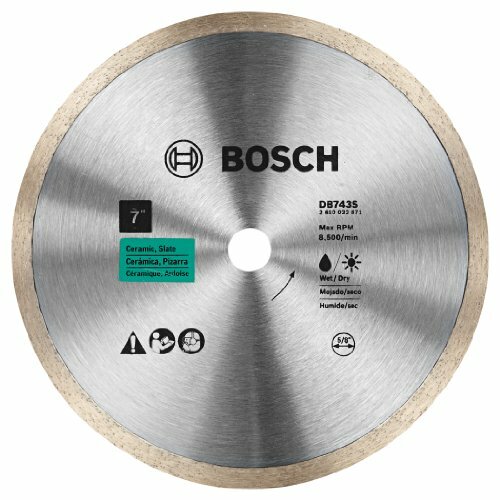 For this reason, we’ve shortlisted Bosch’s DB743S diamond blade. It is inexpensive and does the job that it is designed to do. It will not be perfect for all your tile projects, but you can expect topnotch performance when it comes to cutting ceramic and slate tiles. Buying a good tile saw blade is not simply about buying a high-quality product, but about buying a solution to your problem. It’s about buying a tool accessory that works for your tool and the specific application that you have in mind for it. 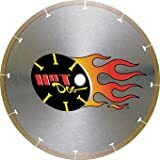 Our guide and reviews focused not only on the qualities that make the best tile saw blades but also on their suitability to certain materials and projects.